A Teak Outdoor Sofa, built for comfort and made for simplicity and relaxation, the Soho Outdoor Sofa is an excellent example of the luxury of high end outdoor furniture. Made from an impressive collection of super wide A-Grade teak wood, this relaxation focused outdoor sofa is made so as not to detract from your enjoyment. Sunbrella® cushions as shown in canvas are available for immediate delivery. W80.5" x D34" x H30"
It’s beautiful, without question, but perhaps it knows your goal for teak outdoor furniture is all about comfort and relaxation. The Soho Teak Outdoor Sofa doesn’t mind taking a more subtle approach to your comfort. It aims to be beautiful and functional, but most importantly, to cradle you in softness and help you forget about anything except serenity, comfort and tranquility. This is a teak outdoor sofa that has all the build quality of other high end sofas, but also has a muted and mellow feel to it. The 6.5 inch wide teak planking that makes up the outside of the sofa is impressive in its ability to be striking, but also to express the next level of luxury without being too bold. 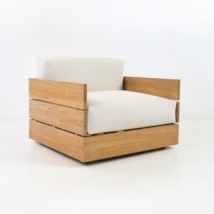 As far as outdoor teak furniture goes, the Soho offers the pinnacle of comfort. The 9 inch thick cushions are wrapped with extra padding around their foam cores, before being covered in the soft and weather resistant Sunbrella® fabric. These plush cushions are included free of charge, and come with your Soho Teak Outdoor Sofa fully assembled, ready to be used the moment it arrives. This outdoor sofa is impressive for so many reasons, but it’s likely that you will appreciate the sustained comfort that comes from the simple but lush design. Because it’s made from A-Grade teak, you can enjoy this seating piece outdoors for a very long time, where you’ll be able to soak up the rays, or just take a nap on the cushy surfaces. This outdoor sofa would work indoors too, where you prefer a very soft and mellow style, as its contemporary lines and high end materials make sense for the more urban and hip locations. The abundance of teak wood showing, makes it perfect in places where natural greens or dark browns exist, like in a garden. 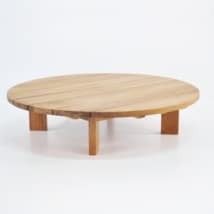 The warmth of the teak is also a perfect contrast for big bold raw concrete accent pieces or cold stainless steel items. In fact, it incorporates the coolness of stainless steel as a connector between all of those wonderful Teak boards. The floating design (thanks to an internal frame support system) gives this teak sofa a wonderful presence on a variety of flooring surfaces or natural ground cover. 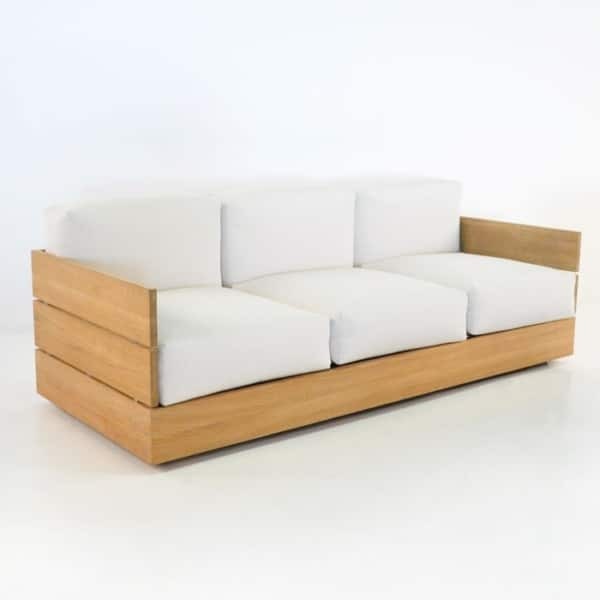 If you desire comfort, an unpretentious sofa, or just a piece you can always count to look great, you might consider the Soho Teak Outdoor Sofa.